Time is passing so quickly and I have so much to do, yikes! But I thought I would post a quick photo from the weekend before last. We had friends visiting from Georgia and took them to the beach. 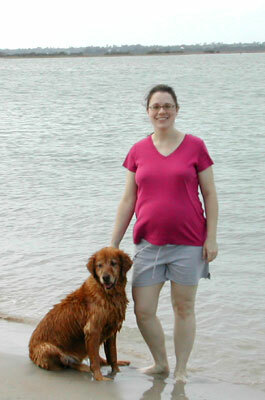 Here I’m with my Golden Retriever, who will, of course, always be my little girl. I wonder if she knows our lives are about to change! Congratulations to you and Mr. Donna! Do you know what you are going to name the baby? You look great! The belly is not oversize to me … healthy size! :) I’m waiting to hear the good news! You are looking very fit and happy. What a wonderful photo and what a beautiful mommy you are! All the best! Oooooohhhhhhh…..baby belly :) The BEST kind! You look beautiful! I always enjoyed being pregnant because my body was so wierd and different and it was OKAY to be round. I didn’t even have the cute belly bump like you do…. :) Your dog is a cutie!! Donna you look adorable! I’m sure the baby will have that same smile of yours. All the best wishes in the weeks to come.